Find credit card offers for people with bad credit. Apply online and start rebuilding your credit today. Consolidate high-interest balances with no interest credit cards. Find the latest balance transfer promotions. Earn miles, points, cash back and more without having to pay an annual fee. Many credit cards even offer 0% interest and low ongoing rates. Earn cash back on every purchase you make with your credit card. Earn even more cash back in your favorite categories. Get airline miles for every dollar you spend on your credit card. Redeem for flights on your favorite airlines with no blackout dates. It's never too early to start building credit. See offers tailored specifically for students. Huge success using info here - THANK YOU! ...want to thank all those that make this the best single source for credit repair information that exists anywhere. 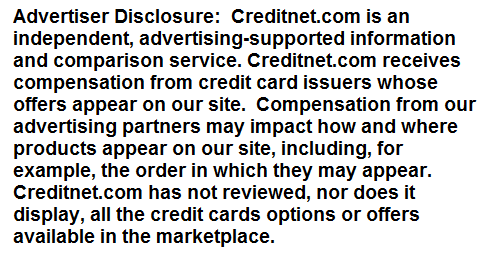 Creditnet.com provides reviews of credit cards, credit report and credit score products, identity theft products, debt help programs, loans and more. However, we're much more than just another comparison site for consumer credit products. Since 1995, we've run the Internet's oldest discussion forum about credit, answered nearly 500,000 credit questions, and served as a trusted resource for credit card advice, news, educational information, and tools to millions of visitors. If you have a question about credit, we want to help. Submit a question to one of our experts, or join our Credit Talk discussion forum, where you can connect with over 30,000 peers and learn how to improve your credit from those who have successfully done it themselves. We look forward to helping you!